General Hospital spoilers for the next two weeks promise Ava Jerome (Maura West) remains loyal to Ryan Chamberlain (Jon Lindstrom). Also, Jason Morgan (Steve Burton) is back to risking his life. Is could be to help Sam McCall (Kelly Monaco) or mob boss Sonny Corinthos (Maurice Benard). Meanwhile, Jordan Ashford (Briana Henry) brings Peter August (Wes Ramsey) into the PCPD. Plus, Carly Corinthos (Laura Wright) is heartbroken. The next two weeks on ABC’s General Hospital bring lots of drama! As the week begins, General Hospital spoilers show that Jason makes a vow to someone. Jason Morgan may be letting Sam McCall know that they will solve the mystery of Shiloh (Coby Ryan McLaughlin) and figure out his agenda. Meanwhile, Ryan Chamberlain’s list of potential victims has a new name on it. Also, Sonny Corinthos is torn and GH spoilers hint that this could have something to do with Mike Corbin’s (Max Gail) deteriorating health. General Hospital spoilers say that Alexis Davis (Nancy Lee Grahn) has a talk with Oscar Nero (Garren Stitt). Because after Alexis’s heart-to-heart with Kim Nero (Tamara Braun), she probably wants to let Oscar know that she is there for him. Monica Quartermaine (Leslie Charleson) worries about Drew Cain (Billy Miller) as he faces every parent’s worst nightmare – – losing a child. Also, Josslyn Jacks (Eden McCoy) is thankful for Cameron Webber (William Lipton) being a good friend to Oscar. General Hospital for midweek reveals that Mike Corbin’s illness is beginning to get the best of him. His health is going downhill quickly and it is devastating his family. There is only sadness ahead for the Corinthos clan. The new Mayor of Port Charles, Laura Spencer (Genie Francis), has an announcement. Then, Carly Corinthos has her defenses up. This might have something to do with the bad feeling Carly has about Margaux Dawson (Elizabeth Hendrickson). On Thursday, General Hospital spoilers indicate that Sam McCall is taken by surprise and likely not in a good way. This mystery with Shiloh has Sam worried. More importantly is the fact that it involves her little sister Kristina Corinthos (Lexi Ainsworth). This situation with Shiloh, aka Hank Archer, prompts Jason Morgan to caution his brother Drew Cain not to trust the man. Jason believes that Shiloh is up to no good and doesn’t want Drew getting sucked in. Also, Alexis Davis gets together with Laura, Monica, and Scott Baldwin (Kin Shriner) to go over Gail Baldwin’s (Susan Brown) will which promises a shocker that will alter the fabric of Port Charles forever. General Hospital spoilers as the week ends say Ryan Chamberlain and Carly Corinthos meet up. Certainly, nothing good can come from this. Ryan Chamberlain is targeting Carly over this Wilson secret. GH fans know that Carly won’t be killed so somehow she’ll be saved. Sonny Corinthos goes to the cemetery to visit Morgan Corinthos’s (Bryan Craig) tombstone. He may encounter Margaux Dawson while he’s there. Elsewhere, Lulu Spencer (Emme Rylan) is disappointed by Peter August. General Hospital spoilers say the second week starts with Lucy Coe (Lynn Herring) confronting Ava Jerome. Lucy may have heard about Ava’s relationship with “Kevin” and wants to know what is going on with Doc. Lucy might also could be trying to rope Ava Jerome into her new tourist idea for Port Charles. Kim Nero confides in Elizabeth Webber (Rebecca Herbst) about everything she is struggling with. Also, GH spoilers hint that Ryan Chamberlain takes a moment to gloat. Does he pay his Kevin Collins another visit at Ferncliff? The villain is systematically dismantling his twin’s life. On Tuesday, General Hospital spoilers say that Kim Nero places a call to Drew Cain. Could be that Oscar Nero takes a turn for the worse. Then again, she may consider taking Oscar out if the country for alternative treatment. Elsewhere, Shiloh puts on the charm for someone while Sam McCall and Alexis Davis catch up. No doubt, Sam is filling her mom in on the recent mystery in her life and how Kristina Corinthos is involved. General Hospital spoilers for Wednesday report that Jason Morgan finds himself in harm’s way once again. He could be at risk while coming to help Carly Corinthos rescue or Sam Mccall. Then, Laura Spencer comforts Charlotte Cassadine (Scarlett Fernandez). Also, Jordan calls Peter August down to the station. This likely has something to do with the serial killer on the loose in Port Charles and The Invader’s coverage. 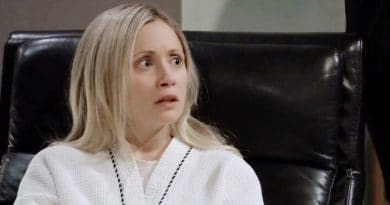 General Hospital spoilers for Thursday show Carly Corinthos has a heavy heart and Sonny Corinthos waits anxiously. Mike Corbin’s health is fast deteriorating and it’s weighing on Sonny and Carly. So, it may be time to think about full-time care for Mike. Meanwhile, Franco Baldwin (Roger Howarth) and Aiden Spencer (Jason David) spend some quality time together baking cookies. Hopefully, Aiden will open up about the other children that are bullying him at school. According to General Hospital spoilers, the second week ends with Ava Jerome standing firm by Ryan Chamberlain’s side. Undoubtedly, Ryan and Ava have pledged not to let anyone come between them and it looks like Ava is keeping her word. Also, Sonny Corinthos pays his respects and Ana Devane (Finola Hughes) finds out the truth about a matter. Certainly, she may get some answers about her health issues. 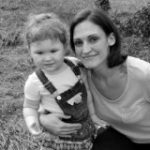 Losing her eyesight was terrifying and her loved ones are scared. It’s one shocker after another lately on GH. Keep watching ABC weekdays so you don’t miss a moment of the life-changing events occurring daily with your favorite Port Charles citizens as Ryan Chamberlain seems to stalk them all! Trust Soap Dirt often for all the best General Hospital spoilers and news. ‘General Hospital’ Spoilers: Lulu’s Real Memories Break Through – Ryan Exposed at Last?